Giving Back » BoardAssist: Identifying and recruiting high impact New Yorkers for board service. "BoardAssist made it so easy for me to join a board." Wondering what factors you should be carefully considering before joining a board? In addition to the obvious questions about the mission of an organization, we work closely with our board candidates to make sure other important variables that are important to them are addressed as well. From the size of the organization and cultural fit, to expected financial commitment and location, we are focused on finding a perfect long term match. 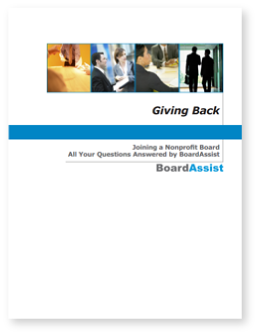 Please download and read Giving Back for a thorough discussion of what to consider before you commit yourself to a nonprofit board, as well as case studies detailing what board members have done on boards, and the answers to the Frequently Asked Questions we receive most. Only have two minutes? Watch our recent nationally televised interview detailing how easy it is to find and choose a perfect board with BoardAssist or read our Top Ten Tips for Finding a Perfect Nonprofit Board.